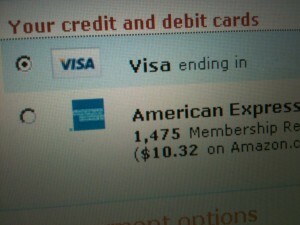 Amazon.com and American Express equals Free Stuff from Amazon.com shipped right to your door. You may already know this. 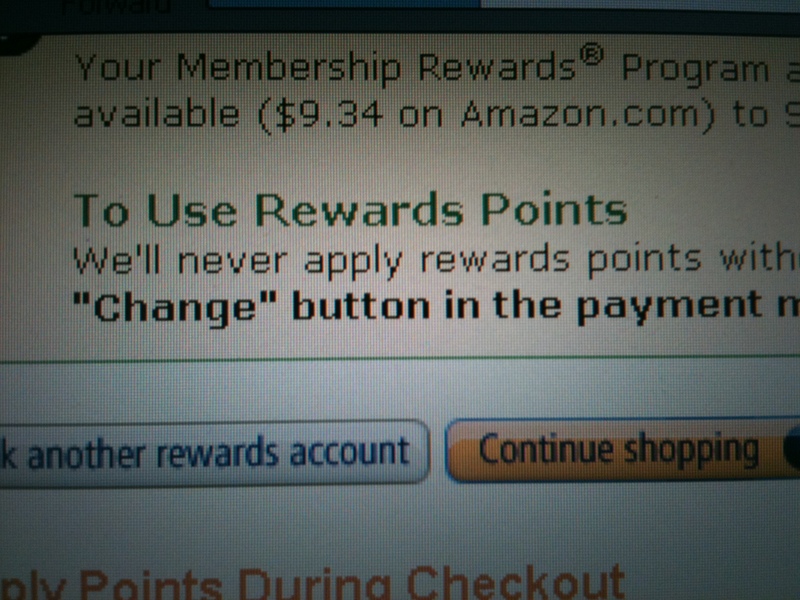 If you use an American Express card, and you generate points… you can link your American Express points directly to AMAZON.com, and it converts points into money, automagically. 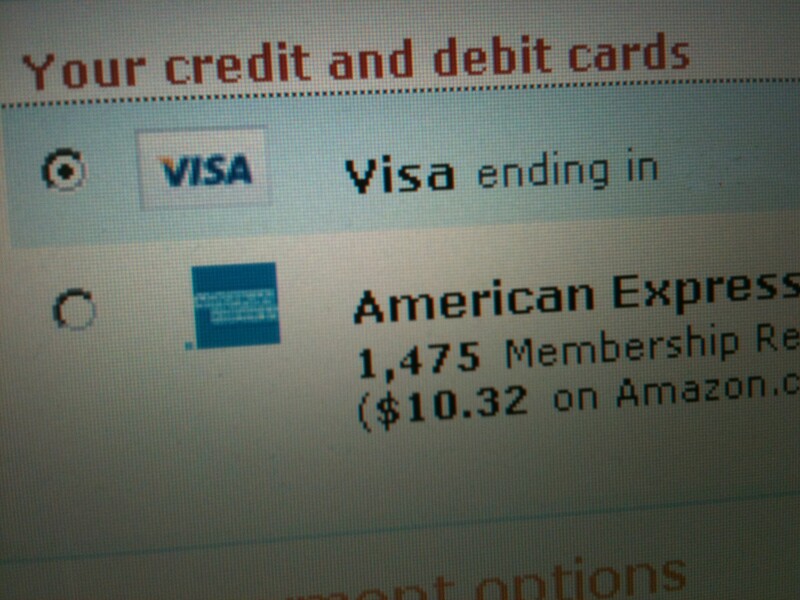 So, when you generate, say, 1500 points (which is not hard) and you link your AMEX card to AMAZON, it will show up as about $10 available for spending. 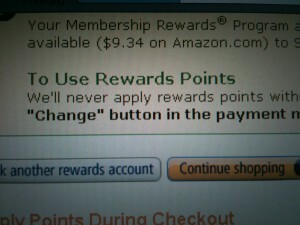 You simply change “method of payment” at the time of check out from your Credit Card, to Your Points. You are done. Your points will now show up as $ money. I have a credit card ritual I established during my “debt free” program. I don’t carry a credit card balance now, but I do use a credit card for routine purchases, such as gas (I know I’m going to buy x amount of gas each week/month). I sometimes use it for groceries, and I always use it for airline tickets. This small amount of continuous spending builds points. Once a year, I buy myself gift cards with my points, and when they arrive, I take a few days of vacation, and I “spend” the gift cards on myself and my friends by going to lunch…“Chili’s” gift card. Getting a massage: “Spafinder” gift card. Shopping: “TJMaxx” gift card” and getting coffee: “Starbucks” gift card. It’s free. It’s awesome. I recommend it. Clear instructions and advice. Love the new email notification and link! I as well am an aspiring blog writer but I’m still new to everything. Do you have any tips for first-time blog writers? I’d certainly appreciate it. Hi! Thank you for reading! Everything I know (thus far) comes from a handful of sources: http://www.chrisbrogan.com/ http://www.marcensign.com/ http://www.copyblogger.com/ and http://themoth.org/ . Chris Brogan and Julien Smith write great books, are very approachable, and have excellent blogs and various resources. Marc Ensign is very good at providing step by step tools for getting your content found, and learning how to not be a creep. Copyblogger is essential for combining all of the previously mentioned, and The Moth is instrumental in demonstrating how to tell a story.